Starburst, from NetEnt, is the epitome of “less is more”. When you take a first look at Starburst, its appearance is rather minimalistic compared to other slots. It somewhat resembles an 80’s style arcade game. The only bling this slot has are the sparkling symbols and game title with the payline numbers running down the sides. 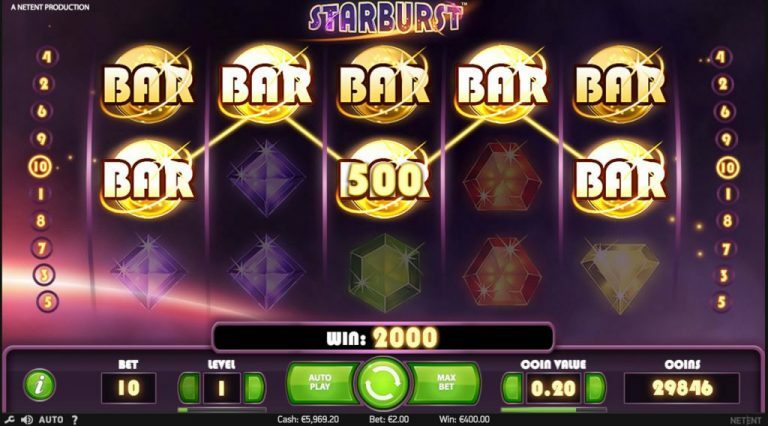 Don’t judge a book by its cover, or in this case, don’t judge a slot by its appearance, because Starburst has become a legendary slots title amongst avid slot players for its fast play, crisp graphics and outstanding gameplay and features. Let’s take a look under the hood and see why Starburst continues to be one of NetEnt’s most popular slots. This 5-reel, 3 row, 10 payline slot with its purple, green and yellow color scheme is actually rather appealing. There is no clutter and the exceptionally crisp graphics, combined with the soothing soundtrack, gives this slot a sense of style like no other. The animation is also outstanding and contributes to making gameplay highly enjoyable. The number of paylines is fixed to 10 with no option to select the number of paylines you wish to play. You can set the coin value (bet) per line, and something slightly different to most slots out there, you can set the level, which is the bet amount per line. For example: If the coin value is set to 0.10 and the level is set to 3, then each spin will be 10 paylines X 0.10-coin value X level 3 = 30. A feature worth noting for new players is that by hovering with your mouse over the payline numbers on the sides of the screen, this shows the payline combination, making it really easy to identify where your winning combinations lie. Starburst only has 7 main symbols and the special Starburst symbol. The lower paying symbols are colored gems, and the higher paying symbols are the well-known, red 7 and BAR that you’ve seen on slot machines for decades. Finally, the most important and bankroll boosting symbol is the multicolored Starburst gem which acts as a wild and can substitute for all symbols. 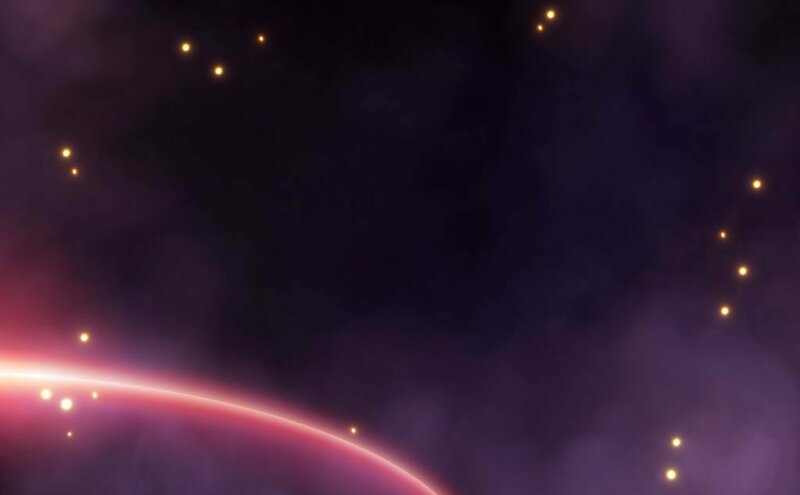 In the bonuses section below, we reveal what makes the Starburst slot so unique and valuable. Starburst slot does not have a dedicated bonus feature but features of the Starburst symbol, in our opinion, more than make up for this. The Starburst can only appear on reels 2,3 and 4. What makes this symbol unique, is that each time it appears, it expands over the entire reel, giving you a minimum of 3 wilds on the screen to make up winning combinations. But, there is even more, because it also triggers a re-spin, up to a maximum of 3 re-spins. During the re-spin, the expanded Starburst remains in place for even more winning combinations to be formed. If luck is really on your side and you happen to get 3 Starbursts at the same time across reels 2,3 & 4, well as you can imagine, you are guaranteed some huge wins. Starburst doesn’t boast a typical free spin feature like other slots and only has the re-spin feature when the Starburst symbol appears. Starburst is not linked to any kind of progressive jackpot and also does not boast any kind of dedicated jackpot like many other video slots. The top payout on this slot is 50,000 coins. Starburst employs a very basic 10 paylines. While you may be intrigued by slots that claim “243 ways to win”, it’s almost impossible to see your winning combinations unless they are in a perfectly straight line. On the other hand, with Starburst, it’s crystal clear. Ultimately, you don’t really need to know the combinations because the game calculates it automatically; if you are a die-hard slots player, it’s always great to see the combinations forming right in front of your eyes as each reel comes to a stop. It’s also worth noting that Starburst supports combinations from left to right and right to left, giving you even more winning opportunities. Starburst has an RTP of 96.1%. Certainly not the highest out there, but still a solid return to player ratio. Starburst boasts a high volatility, so while you may not see a winning combination on every spin, you can expect bigger payouts when they do come up. Starburst is great! Plain and simple, NetEnt has found a winning formula with Starburst. You will find yourself immersed in this unique video slot. If you’re into fancy feature bonus rounds, Starburst may not be your first choice, but we highly recommend giving it a try. Within a few spins, it’s very clear to see why Starburst has become so popular and remains so popular after so many years.